Reviewed 4/18: "turned out beautiful. I bought this to give as gift and now I don't want to give it to him." Real feedback from thousands of customers who have purchased our towel racks, custom made for their space, with hooks and paint colors for their decor. 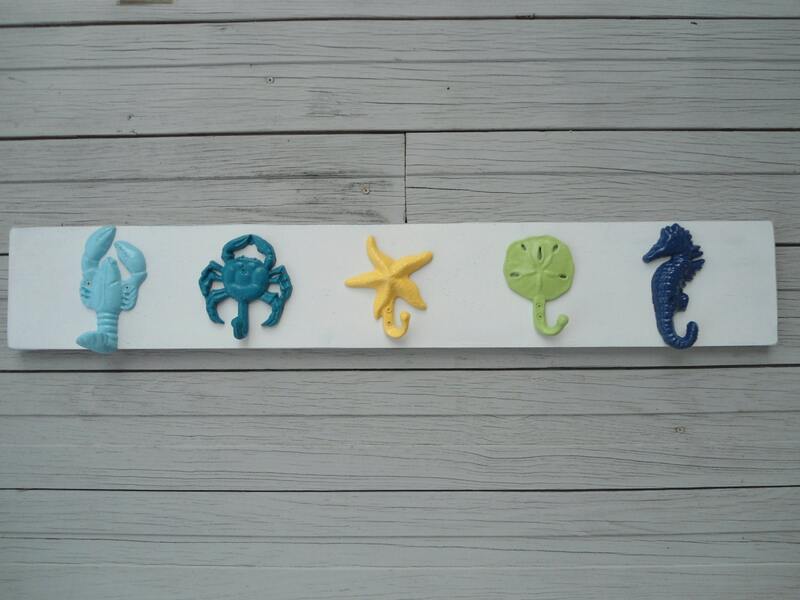 This beachy coastal décor, our popular towel rack, has 5 hooks on a board that can go OUTSIDE. Bring that beachy, lake or river feel to your home every day. This listing is for 5 FIVE hangers on a 32-34 inch board... 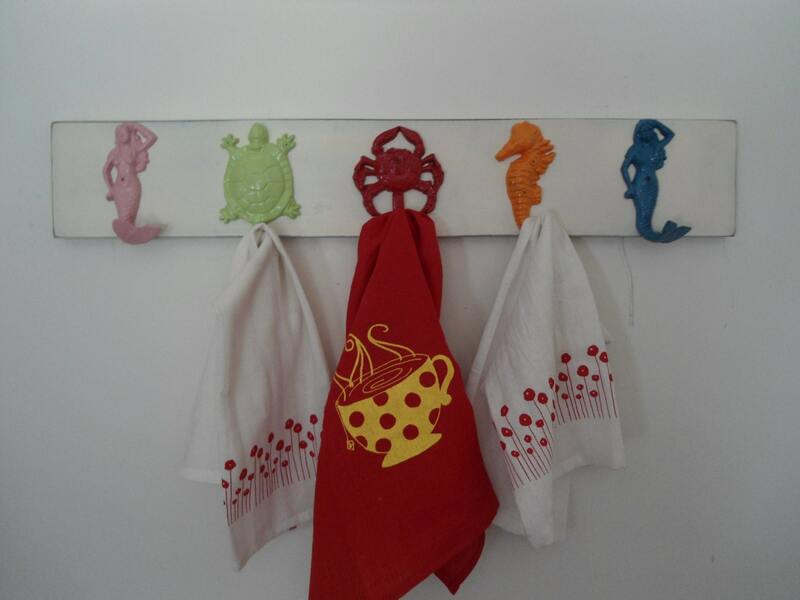 Your beach towel rack can be any combination of mermaids (the one with the tail hooked to the right), starfish, sand dollar, seahorses, turtles, anchors, boat cleats, lobsters, crabs, dolphins (wider) or whales (wider). Shown are different boards we've just shipped. 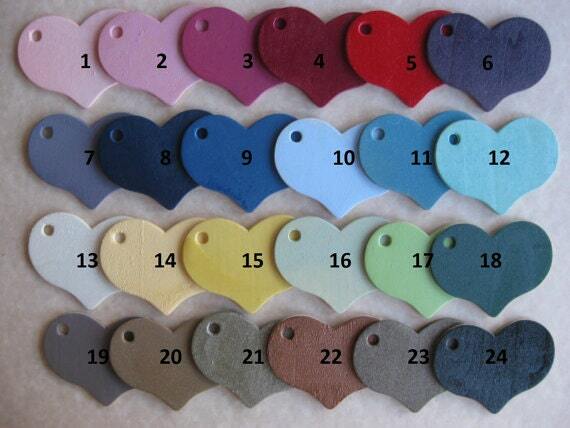 This is one of our best selling items year round, now available in 29 colors: This handmade, high quality, lovely gift, with popular retail stores inspired colors,works with most styles of decor. This beautifully handcrafted wooden wall decor would look terrific in a beach house, cottage at the river, at the lake, or in your pool house, entry hall or mudroom; perfect for that friend who loves coastal décor, whether they live at the beach or not. This listing is for your own custom piece like the one shown, made from premium wood that has been cut by Tommy, painted and then painted with a couple more coats and sanded some more around the edges. Then we attach these lovely hooks; they're cast iron, and we've given them a couple coats of outdoor paint. The dimensions of this sturdy handmade towel rack shown 32-34 1/2" long, 5 1/2" high, and 1-2" deep, with 5 different nautical hangers. This board comes with 2 d ring hangers already attached, on the back for easy hanging too; We recommend that these boards be hung from the studs in your walls or you can use anchor toggle bolts designed for use in drywall (anchor/toggle bolts can be found at your local hardware store). We will position the center of the dring hangers approximately one inch from each end of your board. If preferred, we can ship your dring hangers unattached and you can attach them yourself. Please designate in the message to seller section if you want us to send you 2 d ring hangers UNattached. 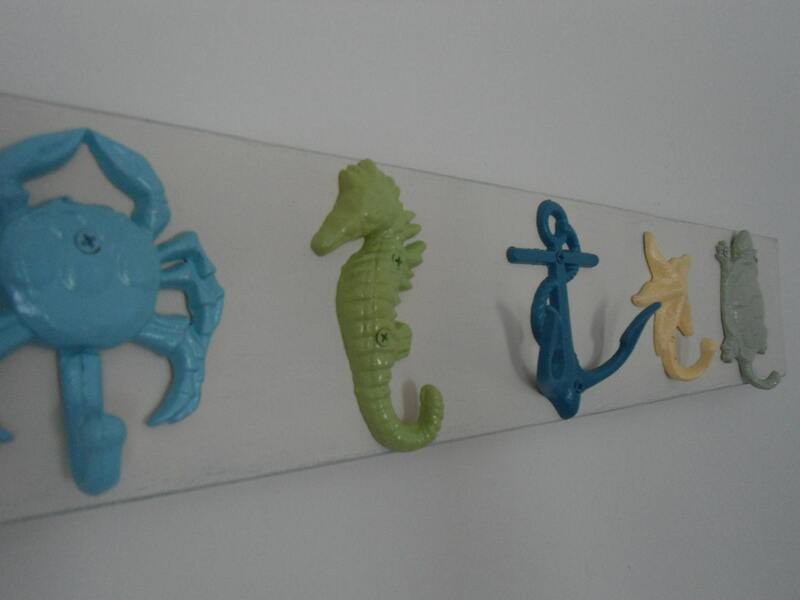 If you only want 3 or 4 hooks, purchase those separate listing; this one is for 5 nautical hangers. If you like this look, check out our other towel racks; we'll continue to add fun shabby chic and beach decor in the same price range as this listing, for mounted and unmounted hooks, on painted pine, reclaimed authentic barn wood, or as a stand alone hangers. Convo us with ?s. This is such a cute towel rack! 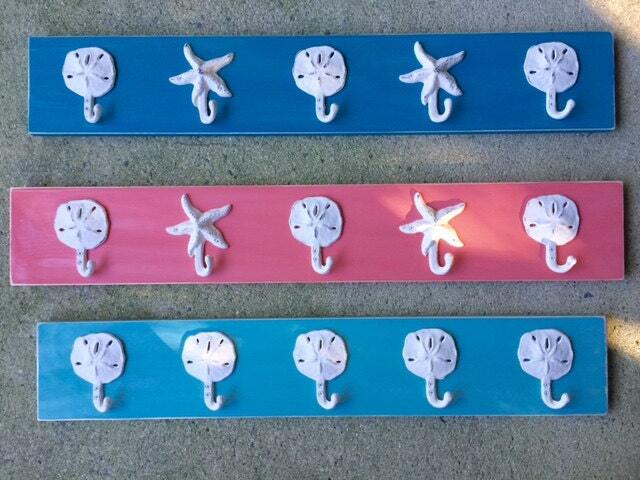 I used it in my kids beach themed bathroom and it is perfect for them to hang their towels on...much easier than the bar rack we had before. This was a customized order and it was done just as I asked and I couldn't be happier with it!